Welcome to the 2017-18 edition of the Timberpups Tracker. This year, we’re taking a different tact. 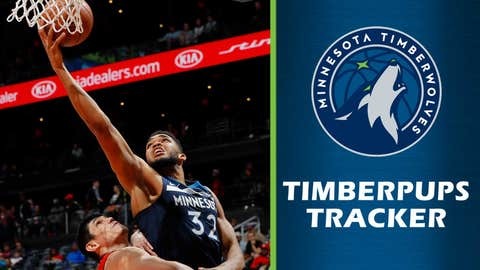 With Minnesota having taken over a G League franchise in Iowa, and renaming it the Wolves, each Thursday we’ll either track the progress of the players who might be of help to the Timberwolves in the future or a current member of the Minnesota roster. We’ll also give updates on the other young players from the previous week. This is the 10th edition of the 2017-18 Timberpups Tracker. Karl-Anthony Towns has proven to be the top double-double machine in the NBA and the Timberwolves’ center was at it again this past week recording four more in four games. He’s now got an impressive 45 double-doubles in 54 games to lead the league in that category. Towns’ 12.1 rebounds per game is fifth-best in the league. Playing in his third season, he’s proven to be one of the highest-producing big men as his 19.8 points per game ranks second among the top-five rebounders. The 22-year-old started the week with 31 points and 11 rebounds against Golden State before a dominating performance against Brooklyn in which he registered 19 rebounds, 16 points and three blocked shots. Towns had 15 points and 13 rebounds during Monday’s loss to Atlanta before tallying 11 points and 10 rebounds at Toronto on Tuesday. Towns has recorded double-digit boards in 46 games this season, including a career-high 23 at Boston. Entering Thursday’s game against Milwaukee, Towns had recorded a double-double in 10 consecutive games against Eastern Conference opponents, the longest such streak this season for any player vs. an opposing conference. — Tyus Jones shot 50 percent from the field last week, including making 6 of 8 shots in a 13-point effort against Brooklyn. — The Iowa Wolves played three games last week and Justin Patton started in all three. The good news: In the first two games he had 19 points and 12 rebounds in 24 minutes and in the second 19 points and nine rebounds in 25 minutes, combining to make 17 of 30 shots (56.7 percent). The bad news: In the third game, Wednesday, he left after playing six minutes in the first quarter and didn’t return after suffering what looked to be a left foot injury after being stepped on — the same foot he had surgery on this past offseason. — Forward Anthony Brown, one of two Iowa players on a two-way contact with Minnesota, had games of 23, 22 and 21 points. — Forward Amile Jefferson, the other on a two-way, had a pair of games with 19 points and 10 rebounds and another with 23 points and 15 rebounds. Jefferson leads the G League with 12.8 rebounds per game, 2.2 more than anyone else.